You have to love when a diorama is as dynamic as this one. There's so much movement and it all looks completely natural and flows perfectly. 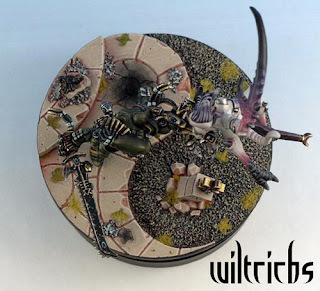 This hobbyist really captured the sense of grace that demon of Slaanesh and an Eldar would have. I'm not exactly sure what parts are converted since it is so seamless. The Daemonette clearly has some conversion work done to get the leaping pose, but the Striking Scorpion is harder to tell. It pretty much looks like a stock model to me, but I have to imagine it was been partially re-sculpted to get him to look up at his attacker. The painting is just as high as you would expect from a model that had won gold at the Golden Demons. It's very reminiscent of the 'Eavy Metal style, smooth, crisp, and clean. 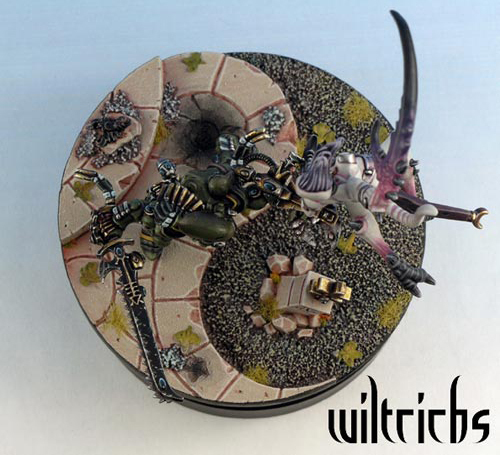 If you haven't noticed the ground they are on is a Ying Yang, with the Eldar and the Daemonette occupying opposite sides of it. It's a perfect fit for these two opposing force, since they really are the Ying to the other's Yang. All together everything in the diorama works perfectly and really creates a evocative battle scene.